If you’re looking for top quality ski trip without any extra hidden costs, then Club Med Peisey is a must. There are amazing childcare facilities for the kids and a great chill out lounge for teenagers equipped with games consoles and a music studio. It’s also got a gorgeous indoor/outdoor swimming pool with epic views over the Tarentaise valley. The property is very well designed, an elegant mix of cutting edge architecture and traditional alpine materials. There is a long bar area, with loads of comfortable sofas to relax in while chilling out with a beer after a hard days ski. The log fire gives chalet feel to the hotel. In Club Med Peisey you can look forward to eating some of the best food you will ever have on a ski trip. But stay away from those French pastries- they are so good you will be hooked. All the rooms in the hotel have their own Ski & boot lockers in the basement on the other side of the hotel which leads out straight on to the slopes all very convenient. The Club Med staff add extra quality to your holiday by looking after you so well, but don't take our word for it: go and try it for yourself. The skiing is ski in ski out. The location of the property enables you to take full advantage of skiing in Paradiski, with the Vanoise express to La Plagne next door. Club Med Peisey-Vallandry offers the promise of an all-inclusive skiing holiday in the heart of the Tarentaise Valley. This authentic, warm-hearted Resort blends in with the mountains, at an altitude of 1,600 metres. 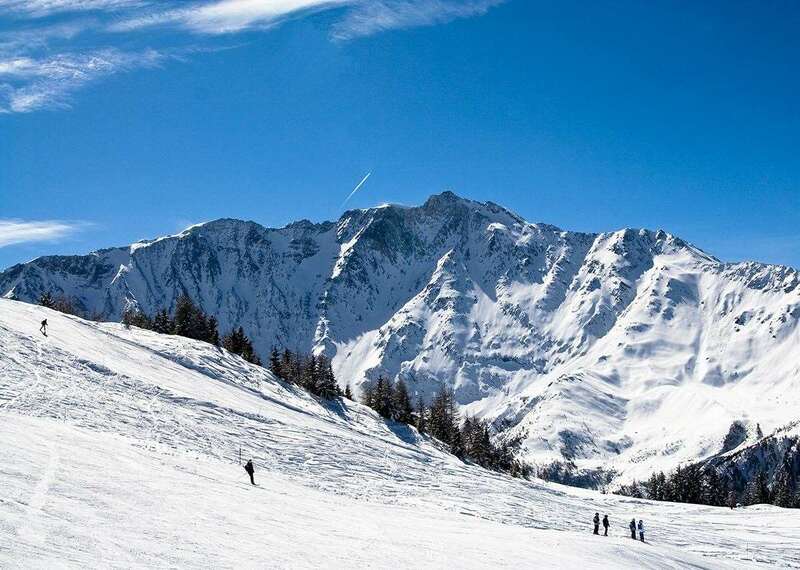 Your winter sports holiday at Peisey-Vallandry is also a great opportunity to explore an unspoilt environment with kilometres of sublime skiing. Perched 1,600 m (5,250 ft) high in the Tarentaise Valley, Peisey-Vallandry is a Resort among nature’s finest. With typical Savoy architecture and surrounded by pine forests, this family-focused winter sports Resort offers Alpine skiing and snowboarding lessons for all ages. And for those who prefer a more relaxed approach, snow shoe walking is a great way to explore the mountain environment. In a charming Savoyard village nestled in the heart of the Tarentaise valley, the Resort is both welcoming and authentic. 8 storeys tall, the hotel is composed of several chalets in the traditional mountain style. Stone and wood give the communal areas a cosy feel, while the rooms invite you to snuggle down with their red and grey tones and thick carpets. Standard Room - A comfortable and elegant room with lounge area, an ideal choice for families. All including Bathroom, European electrical plugs / 220 Volts, Flat-screen television, Hair-dryer, Heated towel rail, Security safe(s) and Telephone. This hotel definitely has the wow factor! Being one of Club Med&#39;s top properties it has an excellent location in Peisey-Vallandry being ski in/ski out (even at the end of the season), the facilities are great with an indoor/outdoor pool and excellent food to never let you go hungry. The rooms are really spacious and lots of family rooms available. It&#39;s a real kid friendly hotel with all the kids clubs to keep the children occupied. The staff are great with nothing ever being too much hard work and always put on great shows in the evening. In terms of the resort, there isn&#39;t a huge amount of nightlife but within the hotel there is always plenty of booze and entertainment. Crazy signs each night if you fancy a little dance! A very enjoyable, relaxing stay and great value with it being an all-inclusive package holiday. Returned from Club Med last winter and loved it, ideal location as from the door of the ski and boot room you ski to 2 lifts which are 100m away. 1 lift takes you to Peisey where you can access Les Arcs really easily and the second is Vanoise Express so you have immediate access to La Plagne Food and service all week was fantastic with a large dining area and loved the 2nd restaurant where we had fondue! The indoor/ outdoor was a real highlight along with the steam room and sauna after a long day of skiing. Entertainment for adults and children in the evening in the very comfy lounge area. Would definately recommend the resort/ ski area and Club Med! The price shown includes 7 nights accommodation, with flights from Dublin International.